Congratulations to Jana L, winner of the tour prize and to Lisa haselton's Reviews and Interviews, the host winner. 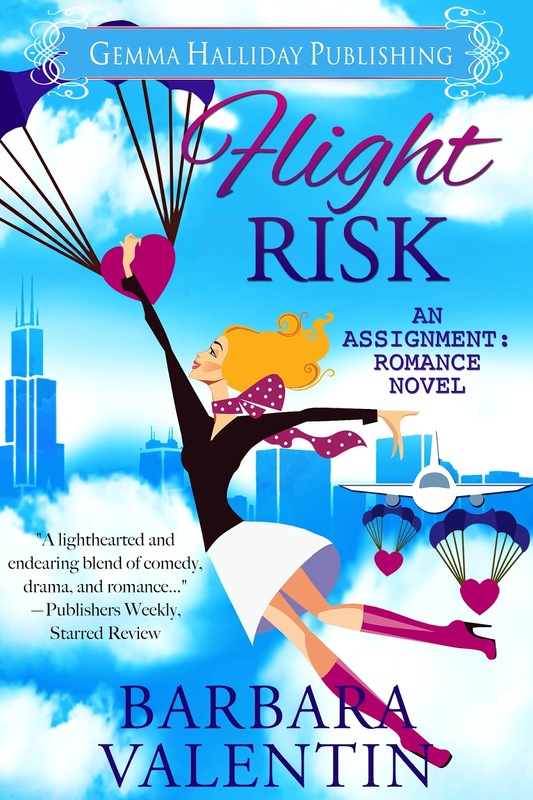 Goddess Fish Promotions is organizing a Virtual Book Tour for Flight Risk by Barbara Valentin, a Romantic Comedy/Chick Lit available now from Gemma Halliday Publishing. The tour will run October 3 – October 14, and Barbara Valentin is available for guest post and interviews. A PDF copy of the book is available for review in conjunction with a guest post or interview. Barbara Valentin will be awarding a $25 Amazon or Barnes and Noble GC to a randomly drawn winner via rafflecopter during the tour, and a $10 Amazon or Barnes and Noble GC to a randomly drawn host. When Aubrey Thomas, a phobic travel writer, must chose between jumping to what she considerers certain death from a skydiving static line or sinking even deeper into debt in the unemployment line, she scrambles to find someone—anyone!—who can help her overcome her debilitating fear of heights. Enter John Trelawney, a charming window washer who thinks nothing of dangling by a cable fifty stories up and claims he can cure her. Everything about John makes Aubrey nervous... including the way her heart kicks into overdrive whenever he's around. But, at the end of her rope, she takes him up on his offer. Can he really help her get over her fear of heights? Or will Aubrey find herself free falling...possibly even in love with him? Can do 3 October. Thanks. Interview. Questions should be on file. I would love to host on 10/07 on Fabulous and Brunette. I can do a guest post - thanks!! Is it possible to have a character interview from the author? I'd love to host on Oct 4 with an interview at Reviews and Interviews. thanks! I would love to do an interview on October 11th. The Reading Addict can host 10/6, guest post, please. Thanks. I can do a guest post or interview on any day.